I like photographs that tell us something about social reality, that provide insights about the human condition, or that tell a story. The Internet is full of beautiful photographs of sunsets, sunrises, children, pets, mountain landscapes, seashore landscapes, desert landscapes, and bad weather landscapes. I admire all of these, especially when well done. But there are not so many of the kind that show us how people live and interact with each other. The photographs I have in mind are usually candid. They capture moments in the lives of people unreflectively going about their daily business. Generally, they are difficult to take because of issues always involved when taking candid pictures of strangers such as the invasion of privacy, the appropriateness of the situation, and so forth. It is true that journalists often take candid pictures of people, but they tend to focus on crisis situations, not the everyday lives of their subjects. Below I have included three photographs with comments of the kind which I have in mind. In the photo above a young stylish couple strolls, hand in hand, down a busy city street in Shanghai, China. As they stroll they appear to be completely oblivious to the street vendors in the background selling fruit. 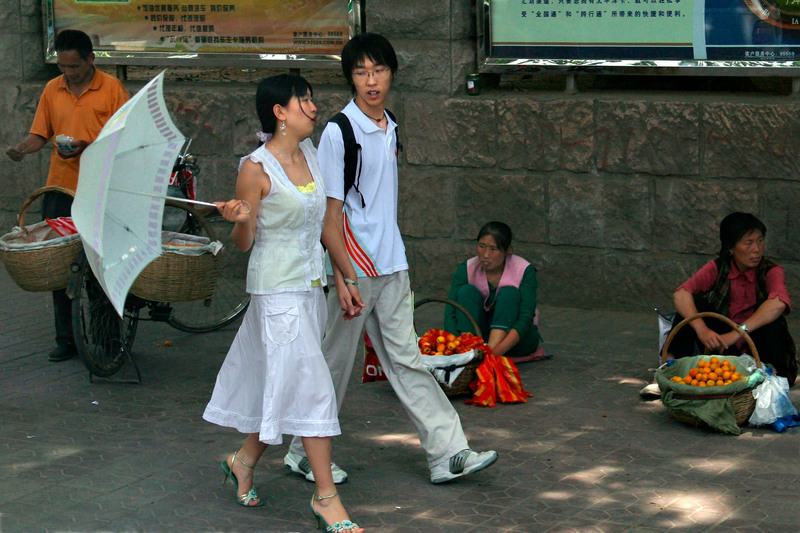 To my mind, the young couple represent the new relatively affluent China. The vendors represent a marginalized sector, perhaps from an older, less industrialized way of life. Fruit vendors like these do not make much money. Indeed, they are hardly in the money economy. Are they the same ethnicity as the young couple? It is difficult to say. Underneath a slightly provocative store window that reads, “Need clothes? Take advantage of the discounts,” an exhausted street vendor tries to get a little rest. Meanwhile passersby check out her merchandise. Everything the vendor sells, she carries in to this small spot on a busy and narrow sidewalk. She does this daily, even though she must compete with the department store that maintains the window behind her. In this busy photo we can only imagine the conversations that are taking place among the people in the foreground. 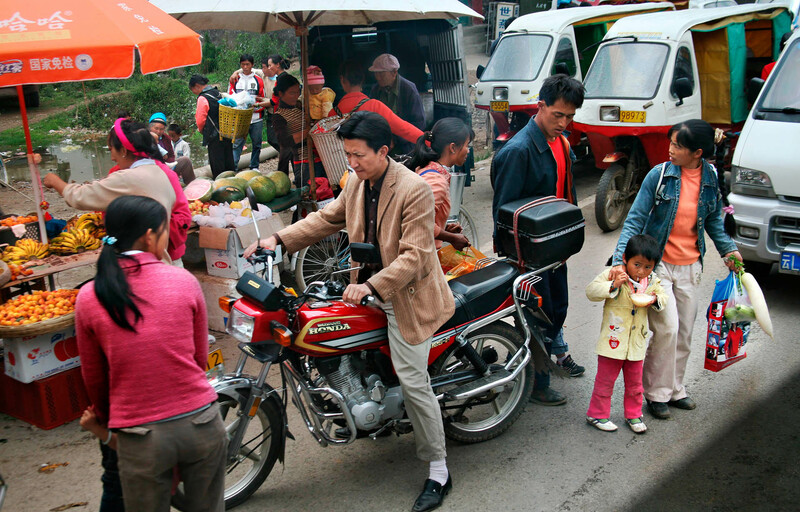 The body language of the fellow on the motorbike and the woman in the pink sweater suggest the conversation isn’t without tension as she manages a little one. Likewise, the woman in the peach sweater and jean jacket looks upset at the fellow with the red shirt. Meanwhile she shepherds a little girl who apparently is still eating her breakfast. Others in the scene are buying fruit which do not appear to be locally grown as they have been delivered prepackaged in boxes. Very nice series of photos Charles – I liked them all. I love all postings on your blog, Charles– but this one especially. Reposting on FB, with pleasure and credit to you. Candid photos with all their issues are still my favorites because they show a bit of what’s happening below the surface. They pique our curiosity as to the lives depicted and better yet, make us think and maybe even feel. Thank you for your comment. I agree completely with your view. Underlying every candid photograph of people is a wealth of culture and personal history.